Today no sugar on the table can not do almost any family. He is familiar to everyone and is part of a large number of dishes. From the point of view of the chemistry of sugar can be called any substance that is included in quite обширн6ую group of carbohydrates, soluble in water, with sweet taste and has a low molecular weight. But in everyday life it is commonly called sucrose, produced primarily from beets or sugar cane. Beetroot is the most common and convenient raw material for sugar production. Because it spoils quickly, the plants that make sugar, usually located near the fields. Beets clean, cut into chips and loaded into a so-called diffuser, extracting sugar from plant material with hot water. The thus obtained "diffusion juice" is usually 10-15% saturated sucrose, and has a dark color, as included in the beet organic substances darken when oxidized. Wastes from this process are fed to livestock. Next is the purification of the diffusion juice. It is placed in covered metal cans and processed with milk of lime and sulfur dioxide gas. As a result of harmful impurities precipitate, which is removed with the help of various filters and clarifiers. By evaporation removed excess water. Next is crystallization, which uses a vacuum device. The size of which in some cases is comparable to the size of a two story house. The resulting product contains sucrose crystals and molasses, divided by centrifugation. The result is a hard-sugar subjected to additional drying. It is already possible to eat. As a rule, make sugar from cane in tropical zones. And the process of obtaining sugar cane is similar to the allocation of his beet, but more time-consuming. Like beets, the cane is carefully crushed to make it easier to separate the juice. Then spend the resulting mass through a special press. As a rule, the cane is pressed twice and between treatments was moistened with water to dilute the juice (maceration process). Next, the juice, as well as in sugar beet production, is purified, and then clarified in a settling tank under pressure and high temperature (110-116 degrees). The next stage is evaporation. For this purpose, special apparatus, in which heat is produced by steam passing through a closed system of pipes. End the process in the vacuum apparatus. Further the obtained substance was carried out through the centrifuge, through the screen mesh which removes the molasses. And inside the left crystalotherapy sugar. Molasses bring to a boil again and subjected to crystallization and centrifugation. Again crystalized molasses are used as cattle feed or fertilizer. 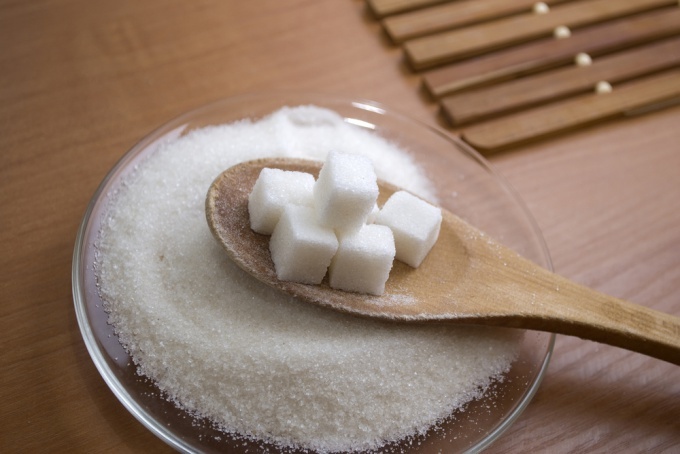 For refining the raw sugar is mixed with sugar syrup, resulting in the dissolved remains of the molasses. The mixture is conducted through a centrifuge, and the obtained crystals are washed by steam. Then they are cleaned from impurities and filtered. After that, the resultant product undergoes the last stage of evaporation, crystallization and centrifugation and then dried. After that cane sugar can be eaten.